HomeArticlesFlame in the Flood. Launches 24th February for PC, Mac and Xbox One. Flame in the Flood is the first title from Molasses Flood, a company made up from veterans of places like Irrational, Harmonix, and Bungie. They’ve contributed to massive critical and commercial successes such as the BioShock Series, Rock Band, Guitar Hero, and the Halo series. 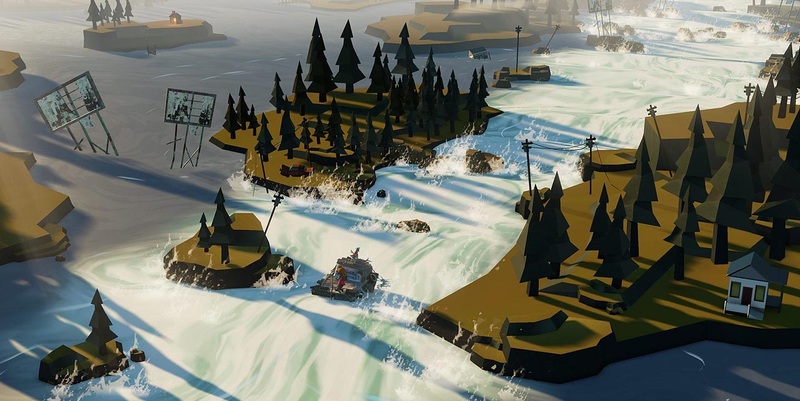 The Flame in the Flood is their first title but looking at the trailer you wouldn’t think it. Survival games are ten a penny at the moment but none seem capture the loneliness of a world more devoid of life than this title. The Flame in the Flood is a rogue-lite river journey through the backwaters of a forgotten, post-societal America. Forage, craft, outwit predators and brave the rapids as you make your way down the procedurally generated river. Hunt, trap, and craft to not only endure, but survive. Get lost in the fragile beauty of a forgotten world designed by veterans of both BioShock and BioShock Infinite, played to the tune of an original soundtrack composed by alt-country star, Chuck Ragan. The wildlife you encounter will play a huge part in the direction your game takes. From Bears to Boars and Wolves to Snakes, everything out there will impact your chances of survival, so much in fact that ahead of launch Molasses Flood have made a YouTube vid highlighting some of the dangers you face and how you can expect some of this wildlife to react. Check out the ‘Wildlife Tips’ video below. Flame in the Flood launches for PC, Mac and Xbox One on February 24th. Even if survival games aren’t your cup of tea it’s well worth investing some time in this beautiful looking debut title from Molasses Flood. Just Cause 3: Sky Fortress announced.